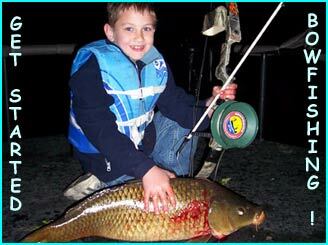 photo of Pat Lefemine Jr. (8 yrs old) with his first carp - a nice 25lb. common taken in May, 2004 on the Ct. River. In my opinion, bowfishing is the best way to introduce new people to bowhunting and archery. Especially kids who are not quite old enough to hunt - yet may be bored with accompanying someone else as an observer. Bowfishing has a lot of advantages as a recruitment tool; it is often fast-action, it is typically done in warm weather, and you can hoot and holler all you want - the fish don't mind. I've been enjoying bowfishing for 20 years and have experienced just about every type of bowfishing available - including wading, night fishing on a boat, saltwater, and big game bowfishing. These days, most of my bowfishing excitement includes introducing others to the sport - especially kids. For me this is more rewarding than shooting all those fish myself. 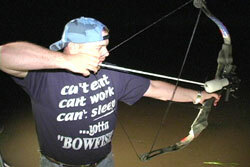 Here at Bowsite.com, we've seen many topics on how to get started in bowfishing. We put together this summary of the different kinds of bowfishing along with the techniques and my personal opinion on gear. We then discuss how to find a place to bowfish, how to deal with 'refraction' and finally what to do with your carp after you've landed him. As usual, if you have any questions, there are lots of good folks willing to answer your questions in our Bowfishing Section, or you can email me directly from our Bowsite.com contact page. Why most people miss "high"
This is how I did it for 17 years and loved every minute of it. 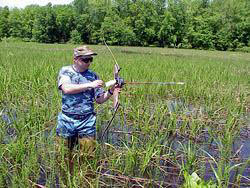 Find a good marsh, grab a pair of hip waders, your bow, and a fish arrow, and stalk carp in the shallows. 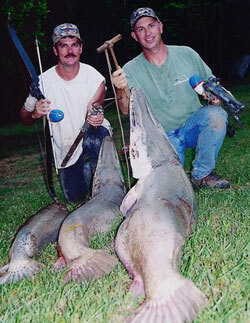 Typically this type of bowfishing is done during the spring when the fish are spawning. Pre and Post-spawn the fish are harder to find and the action drops off considerably. Lakes, Rivers and ponds with shore access, or marshes for wading. To find carp, the best thing to do is to ask folks here on the Bowsite.com state forums as a start. Also call your DNR fisheries biologist and tell them you are looking for heavy concentrations of carp, gar, etc. Don't forget to search the web using Google - simply type in "carp fishing in MI" etc. for a search term to start. Look for the hard-core carp angling sites as they usually contain a wealth of information. 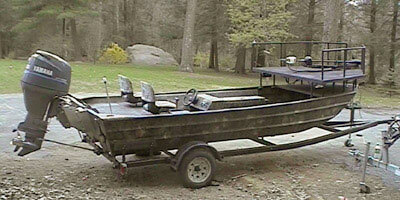 This is the ultimate in bowfishing, but because of the high entry costs associated with rigging up a bowfishing boat - few people get a chance to enjoy it. If you have a boat already, you might try rigging your own lights and generator setup. Lots of guys get away with cheaper setups than I've outlined below. Unlike daytime bowfishing, any time of year is good. 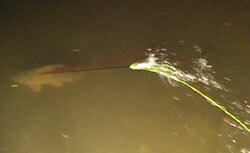 It is best during the spawn as this is when most of the fish are in the shallows and on the move. Don't forget fall fishing as well when the water is clearest and the fish are in normal feeding patterns. Lakes, Rivers and ponds with boat access. You would find bodies of water same as with daytime fishing suggestions above. Having a boat gives you a lot more mobility and access to a variety of waters. The author's bowfishing boat is an 1860 F&F Tunnel-hull Jon boat with a 100HP Yamaha 4-stroke, 90" custom shooting platform with 6 Halogen lights, Yamaha 3000 generator, and a Minn-Kota Powerdrive Trolling motor with a co-pilot wireless remote control. This is where things really start to heat up. Bowfishing for Gator Gar, Big Southern Stingrays, Sharks and Alligators are probably better suited after you've got some experience under your belt. Big Game bowfishing is rarely done via stalking or from shore however some guys have successfully pulled out some big fish without a boat. Sam Lovell and freind with a beautiful Gator Gar shot in Texas. 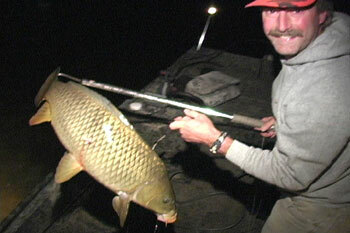 Bowfishing is best during the spring when the fish are spawning however summer is good too. Freshwater Lakes, Rivers, ponds for Gator Gar. Saltwater or brackish marshes and open water for sharks, and rays. You would find bodies of water same as with daytime fishing suggestions above. Having access to a boat is generally a 'must' for this type of bowfishing. Where to buy your bowfishing Equipment? Rich Hackner with a nice Common shot on the Ct River. Water Depth - the first thing I look at is the consistency of water depth. In the pond above, there is a significant shallow section at the North and South end of this pond. Clear water to 3-4' is ideal. Flooded Grasslands - Carp like to hang out in flooded grassy areas. This is especially true during the spawn as carp project their eggs in these areas. In the map above, the North end of this pond is a great place to look for carp. Access to Carp Waters - Carp will leave big rivers and other significant bodies of water to spawn. In the case above, I had never bowfished this area before 2004, but I had gotten a tip from some anglers while bowfishing another section of the Connecticut River and since the CT River is a major carp fishery, it made sense that carp would like this spot. Water Clarity - water clarity (or turbidity) is important to bowfishing. If the water looks like creamed coffee - muddy, the bowfishing will be tough since visibility is limited. Areas with heavy concentrations of zebra mussels - which purify water, are good bets for clearer water as are colder waters of the North. There's not much you can do to predict water clarity other than check it out yourself or listen to reports from fishermen returning from the area. Keeping a log of spawning activity and water clarity during a particular tidal period is helpful. This year I've introduced 15 new people to bowfishing. Every one of them had a blast and shot fish - but every one of them shot high 99% of the time. In fact, unless I coached them through each shot - many would never have adjusted their shots to realize that the fish simply is not where your brain is telling you it is. It's called refraction and it there's a bunch of scientific reasons for it (snell's law) but there is only one thing you need to know. SHOOT LOW!!!! What I tell people is to aim for the bottom of the fish, and then drop down 10". This is not entirely accurate since the closer your angle is to 90 degrees, the closer you would aim at the actual fish - still it seems to help most people just starting out. Try the interactive simulation below to understand what I'm talking about. Use your mouse to drag the yellow shooting line to the fish (air side) and follow that yellow line into the water to see where the fish actually is. Here's a real-world scenario based on a shot taken this past summer. 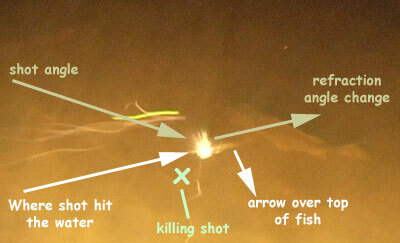 The arrow can be seen hitting low based on where the carp is - but it's not low enough. You can see the angle of the shot bending dramatically - resulting in a miss. The shot should have been at least 6" lower to score a perfect hit on the center of this fish. Carp and contaminants. Carp, like other sport fish, can build up contaminant levels which may limit consumption. Consumption levels of all fish should be checked by contacting your local DNR office and inquiring about fish advisories before you head out. Handling carp. The key to good eating is the proper selection and handling of caught carp. If the fish are taken from waters which may produce bad tastes or odors, sniff the gills. If they have a musty odor (oddly, not every fish from the same water body will), then the flesh will likely taste bad unless you hold the fish in clean water or off the bottom for 5-7 days. If it smells fine, bleed it by cutting the artery near the tail, or a large artery between the gills. Gut it immediately and place the fish on ice. Alternatively, keep fish alive as long as you can in a mesh bag or on a clip-stringer. Fleecing. If you wish to leave the skin on, remove the scales with a sharp filleting knife. Insert the tip of the knife just ahead of the tail fin with the sharp edge facing the front of the fish. Loosen the scales at the tail, then work your way towards the front of the fish along the belly, lifting the scales and using a sawing motion as you work towards the dorsal fin. Skinning. After filleting in the normal manner, remove the skin and scales by placing the fillet skin side down and cutting through the tail meat to the skin. Move the knife edge so that it is parallel to the skin and cut while you lift the meat away from the skin. Turn the fish over. You may see some reddish-brown flesh. This flesh will be more strongly flavoured, and you may wish to remove it. Scoring. Carp have a series of small, thin, free-floating bones found about one-third of the way below the muscle surface both above the lateral line, and below the line along the back half of the fish. These bones can be broken up by lightly cutting through the bones using a number of shallow, parallel strokes. Cooking will further soften these bones so that they will rarely be noticed when eating. Cooking carp. Carp can be baked, roasted, broiled, fried, barbecued, poached, smoked, marinated, or used in casseroles, chowders, chili or quiche. Try some of the recipes below, or substitute carp in your favorite fish recipes. Clean and dry fish. Rub inside and out with salt. Mix stuffing and stuff fish; covering the exposed stuffing with foil. Brush the outside of the fish with butter or margarine. Bake at 375oF, 15 minutes per pound. Barbecued carp. Place fillets or steaks on an oiled grate 4 to 6 inches from the coals. Allow oils to drip from fish, but keep water on-hand to douse flare-ups. Turn with a spatula, and brush with butter and lemon juice when done. Do not cook in foil. Place fish in a single layer in a pan and combine all remaining ingredients and pour over the steaks. Marinate for 2 hours. Drain and save the marinade for basting. Broil fish 4 inches from heat until done, basting with marinate to brown both sides. Remove skin and bones. Finely chop carp and combine with other ingredients. Spread on crackers or rye bread. Carp fried in beer batter. Blend flour, salt, baking powder and baking soda. Add beer and eggs and stir until batter is light and frothy. Dip boned fillets in batter and deep-fry at 375oF until golden. In conclusion, bowfishing is one of the greatest sports I've ever enjoyed. Not only does it give you something to do in those long boring spring and summer months, but it is a great way to bring new people to archery and bowhunting. Give it a try - you'll be glad you did!